Here is an excellent home chest workout. The exercises target the entire pectoral muscle group. If you are in a hurry they can be grouped into supersets, cutting the workout time by 50-70 percent. Be sure to perform each exercise with strict form. Bad form can cause injury, and worse, can fail to work the muscles it was intended for. The ‘pecs’ are used for a variety of actions which contribute to shoulder joint mobility. The pectoralis major is used to move the humerus across the chest, as a person would do heaving a sand bag from side-to-side, executing a tennis forehand hit or pitching a baseball with a sidearm motion. Exercises which mimic this action are cable crossovers and cable/dumbbell/suspended flyes. 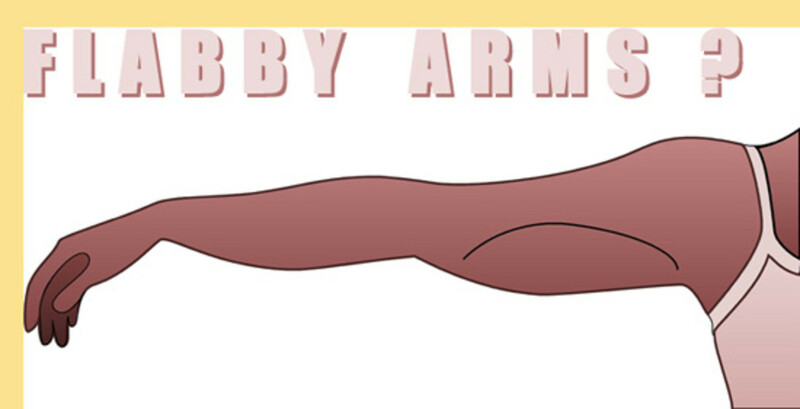 The second action is humerus adduction, which means moving the arm laterally away from the body. This action is demonstrated in the eccentric (negative) portion of the ‘iron cross’ in gymnastics, or in the eccentric portion of the standing cable crossover. Third is medial rotation of the humerus. This action is like the pinning motion used in arm wrestling. It can also occur to a lesser extent when doing dumbbell flyes and rotating the thumbs towards each other towards the top of the movement. The fourth action of the pectoralis major involves two parts. The ‘upper’ portion, closer to the clavicle helps push the arms away from the body and rotate the arms into the body. The first motion is typical of an incline press, while the second can be demonstrated by holding the hands together in front of the lower belly and squeezing the shoulders towards each other. The second part of the fourth action includes downward motion of the arms in the sagittal plane. The movement is executed in straight arm cable pull-downs or pullovers performed on a bench. It can also be seen in the casting motion used in Clubbell training or fly fishing. While external resistance may be an advantage in executing these actions, there are many exercises for developing a big chest without them. The program below is designed for someone with no equipment. Each exercise is listed from beginner to advanced, but only as a general guideline. 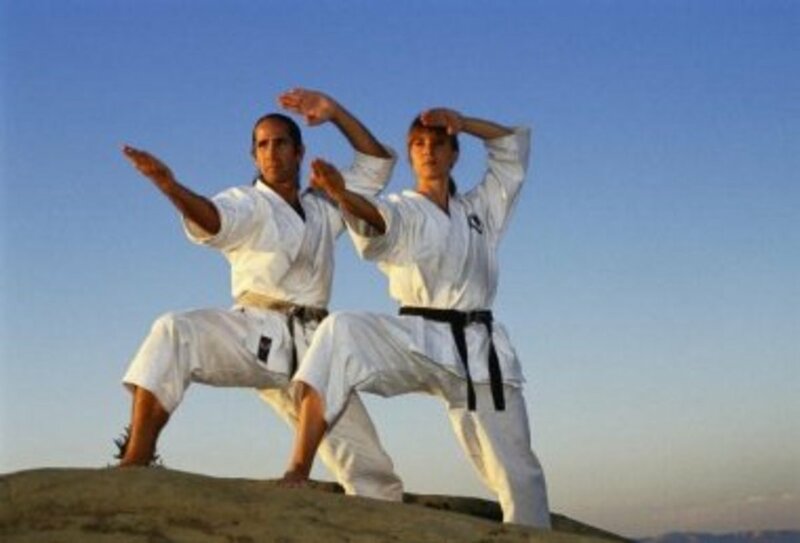 Adjust the amount of work to your individual needs and perform each move with precision. These work great...just make sure the chairs are on a non-slip surface. Easy does it. Having your feet on the floor reduces the difficulty. 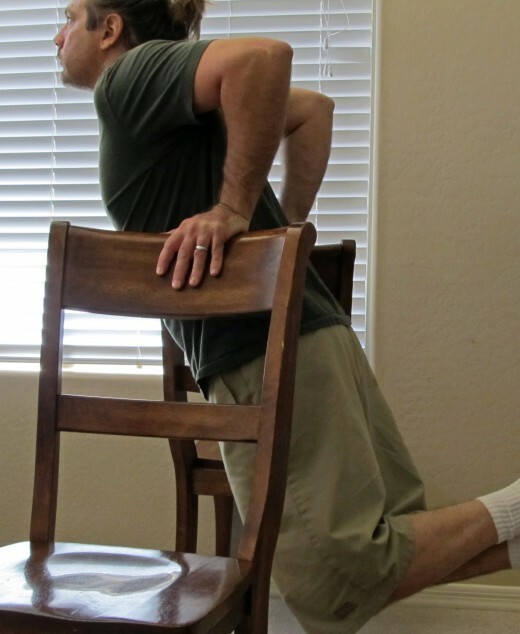 Chair Dips; a great alternative if regular dips are too difficult. Having your feet elevated increases the difficulty. This chest workout will build chest muscles even if all you have are two dining chairs and a floor. Truly, it would be difficult to have no equipment in a typical household. ‘No equipment’ here implies an absence of weights, resistance cables or other traditional exercise equipment. Hindu Push-ups: This is the upward motion of down dog in yoga, or half of a dive-bomber push-up, which is next. Do 20-30 reps, but do not push to exhaustion. This is just a warm-up, so break it up into two sets if necessary. Finish off with neck, shoulder and arm rotations. 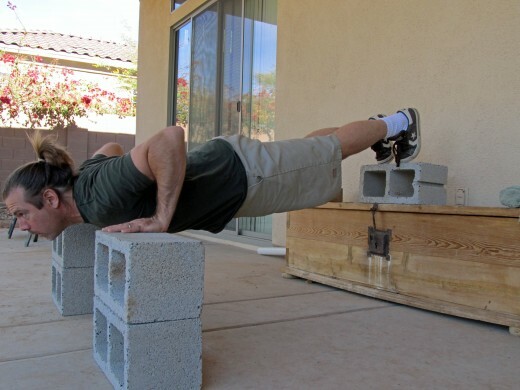 Divebomber Push-ups: Watch the video for the correct form of this exercise. 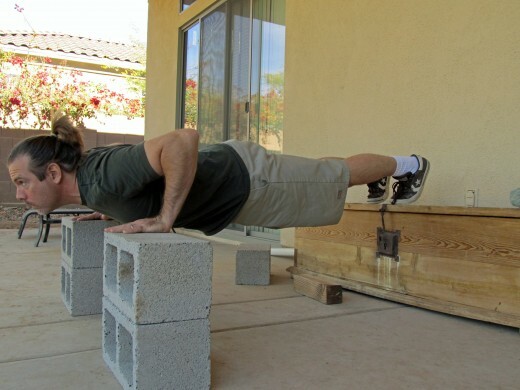 If these are too difficult, substitute more sets of the Hindu Push-ups performed in the warm-up. The range of motion involved in this exercise affects all the chest muscles. Advanced: 4-5 x 12-15 with 3 second pause at the middle of the movement. The middle portion will be when your chest is closest the ground. 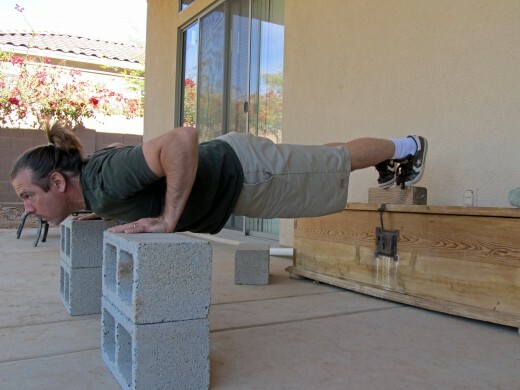 Progressive decline push-ups: These will be executed on the floor or between two chairs, stools or blocks. The elevation allows the chest to go through an increased range of motion, bringing more of the pectoral muscle into the effort. *Caution, to avoid strain or injury, do not go to a maximum stretch. Instead, go just past the level of the chairs or blocks and never into an uncomfortable position. Use a slow cadence 2 to 3 seconds down and 2 to 3 seconds up. See the photos for an example. The first set will be executed flat; the second we will raise our feet up a few inches, the third a few more. A moderate increase in foot elevation makes a big difference and keeps the emphasis on the pectoral muscles. Go to high and the emphasis of the exercise moves to the shoulders. 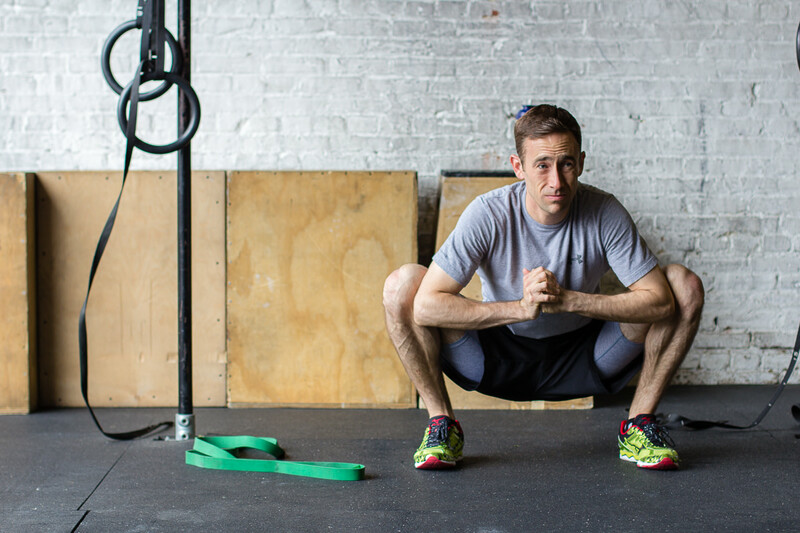 For intermediate and advanced, choose your favorite elevation to execute the extra sets. There are many ways to get the elevation you need. One would be to perform the push-ups between two chairs with a ladder behind you. On each set move your feet to the next rung. Another would be to place the chairs in front of a couch or bench. Use thick books to raise the feet after each set. Close ‘Grip’ Push-ups: With a hand position just inside the line of the shoulders, do these in strict form without explosiveness. Do not lock out. Rather, keep tension on the triceps for the whole set. These can be executed between two chairs as long as the chairs are stable. It helps if one is pushed up against a wall or if both are fixed on a rug. Apply a slight outward pressure. Make sure your elbows line up underneath your shoulders and do not ‘flare’ them out to the side. Lower yourself until the arms are at a 90 degree angle to the body and push back up. Both the chest muscles and the triceps will be affected by this exercise, so it’s a good finisher. Beginner: 2-3 x ??? (as many as possible.) If you can not execute at least three good repetitions, do bench/chair dips as demonstrated in the picture. Do as many as possible. *A note on reps: In general, 3-5 reps are considered optimal for increasing strength, 8-12 for building muscle and 12 and over for increasing muscle endurance. 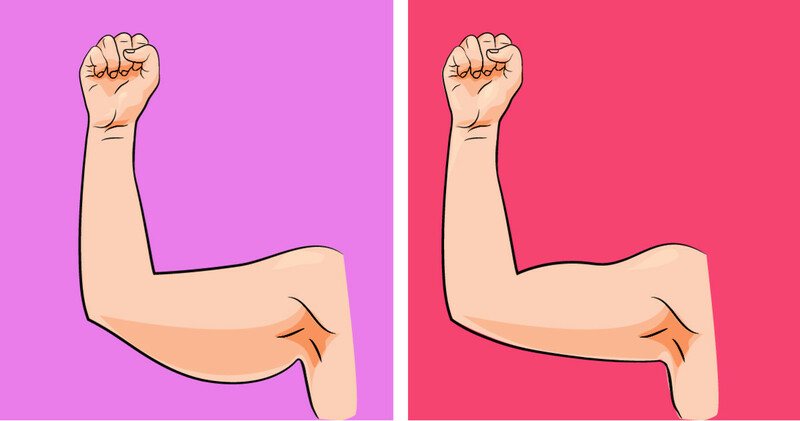 For these exercises, and in keeping with the ‘no equipment’ mantra, if push-ups or dips in any form are way too easy, add weight in the form of cans, rocks or books in a backpack. 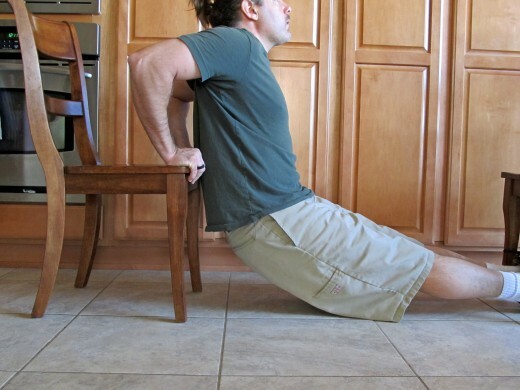 If push-ups or dips are too hard, do them on your knees or use your legs to assist you. As with any exercise program, make sure you are healthy enough to get started. Keep in mind, there are many ways to exercise the pectoral muscles, so after using this workout for awhile, experiment with new exercises. Always focus on the muscle action, feel it working and stay injury free. The Best Prices on the Best Home Gym Equipment! Really good information. So many people feel you have to go out and purchase a bunch of exercise equipment in order to do a fitness workout. I try to remind people in my hubs that you can get into great shape just using your own body weight if you perform a routine correctly. Thanks for sharing this information! Thanks Neil, glad you liked it! excellent but simple workouts! keep it up wooo Thankyou!